Today is the release day of the first book in Meg Cabot's brand new trilogy, Abandon ! I adored this book and I hope you pick it up! Kate has spent the past four years taking care of her mother, who was diagnosed with cancer at the beginning of her freshman year of high school. She's skipped school, avoided making friends, and put her life on hold, and now her mother wants to move away from the New York City home and live in Eden, Michigan so she can die in the town she was born in. Kate isn't thrilled about moving, but she'll do anything for her mom. She doesn't mind terribly that everyone in Eden is pretty weird...until a prank goes horribly wrong and the mysterious Henry steps in, offering her a deal she can't refuse and revealing a darker world that could be Kate's...if she can pass the tests. 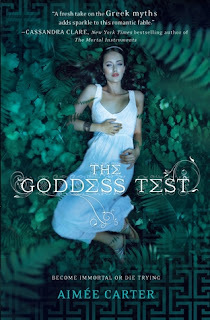 The Goddess Test is an engaging and creative sort of sequel to the Persephone myth with a lot of inventive little twists. Kate doesn't reach out to others much at all, so it's gratifying to see her tentatively make new friends to help her puzzle over the mystery of Henry's abilities and bargains. Her relationship with her mother is very sweet and heartbreaking as Kate struggles to accept the idea that her mother is dying and she must soon say goodbye. When Kate must move to be with Henry, a whole new set of problems then comes up as her life is in danger and the enemy could be anyone. No one is who they first appear to be in this book, which leaves you hanging in suspense, and Carter cleverly works everything out in the very end with more than a few surprises. Henry and Kate's gradual romance is sweet and realistic, despite the supernatural elements of the story. The ending is satisfying, but Carter leaves it open for a sequel that would be happily welcomed by readers. Cover Comments: This is such a pretty cover! I love the Greek designs and flair, and the cool, darker colors--very neat! Digital galley accessed on Netgalley.com. It seems like everywhere I turn, everyone is talking about A Discovery of Witches ! So, naturally, the thing to do is spread the word and hold a contest, thanks to the generosity of the publisher, Penguin Group! 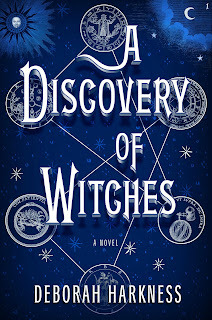 "A DISCOVERY OF WITCHES begins on a late September afternoon when Diana Bishop, a bright, young historian studying amidst the ancient stacks of Oxford’s Bodleian library, calls up a medieval manuscript of alchemical illustrations. 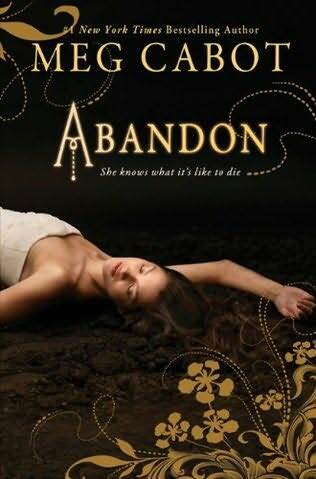 As soon as she picks it up Diana realizes that the book—Ashmole 782—is an enchanted object of untold power. As it turns out, Diana is not only a first-rate scholar of seventeenth- century chemistry but also a descendant of a long and distinguished line…of witches. She’s spent her adult life distancing herself from her supernatural destiny, and after a quick look at Ashmole 782 she sends the book back to the stacks and her magical history with it. As their challenges grow, so do Diana’s powers, and together she and Matthew must battle the forces rallying against them to unlock the secrets of a manuscript whose pages promise clues to a mysterious past and uncertain future. 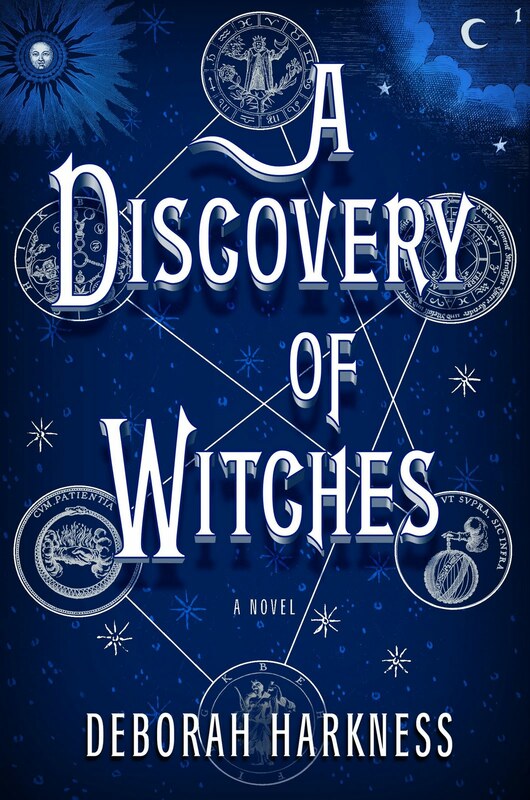 Equal parts history and magic, romance and suspense, A DISCOVERY OF WITCHES is a mesmerizing and addictive read." And if you've already read the book, then who do you think would make the best Diana? Or the best Matthew? Vote below! Moonglass is a beautifully written novel, full of excellent imagery and perfect beach settings. Kirby has a talent for putting words together to create the most affecting, emotional sentences that will have you falling in love from the first page. Anna's observations and commentary on her life are authentic, and her voice will easily pull you in. This book is less structured, and more of a slow exploration of Anna's memories, feelings, the stories from the past and how they fit together and relate to the present. There is a lot of really great emotion between these pages, especially with Anna's relationship with her father, as they deal with her mother's death and their lack of communication. Everything comes together nicely in the end, and Anna's romance with Tyler is the perfect topping to this bittersweet summer confection of a novel. Make sure to pack Moonglass along with your towel and sandals when you head to the beach this summer! Cover Comments: I just adore the tall view of the beach with the bright moon and the blues and purples of the cover! It's so pretty! This is a fun beach cover that doesn't fall back on the stereotypes! 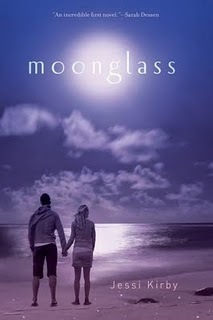 Moonglass is available on May 3rd, 2011! Today I started We'll Always Have Summer by Jenny Han! I love this series, which started out with The Summer I Turned Pretty and continued with It's Not Summer Without You. On the back of the book was one of those cool picture-code things (what's the official name for them?) that you snap a picture of with your phone and it unlocks extra content. This one led me to this cool trailer, which I think will get you in the mood for summer and for Jenny Han's books! Pick up We'll Always Have Summer in stores starting next Tuesday! I love short stories. I was totally the geeky kid in English class that paged through the gigantic textbook each year, peeking at all of the short stories listed, hoping that we got to read every single one. And as I got older, I definitely learned to appreciate the authors of short stories--they have to tell their story in a fraction of the amount of words it takes to make up a novel. I think that good short story writers are some of the most talented there are. However...honestly, how many of you reading this blog post right now buy anthologies on a regular basis? Certainly there are some very interesting and worthwhile anthologies out there (Love is Hell , Zombies vs. Unicorns , The Poison Eaters ), and they're great books to buy if you want to get a sampler for authors whose book you think you might want to read. But when it comes to spending the $10-$20 on a brand new book, I'm more likely to go for a full-length novel than for a collection of short stories, some of which I may not like at all. Which is why I think that short stories and e-publishing might have a long, wonderful future together. Have you ever seen an anthology that contains a short story by an author you really love and wanted to read just that story without having to buy the entire book? Well...what if short stories were available on Amazon, Barnes and Noble, and Borders in digital format? For a dollar or two, you could download short stories by your favorite authors or try a new author without having to spend a ton of money or buy an entire anthology. Plus, I know tons of authors whose works I love and have written short stories that are scattered about here and there in hard to find anthologies or online somewhere--Cassandra Clare, Maggie Stiefvater, Tamora Pierce, Meg Cabot, and many more. I would totally download all of their short stories if they were available in a short story e-book format for my Kindle. Some authors and publishers are already doing this, and I love it! 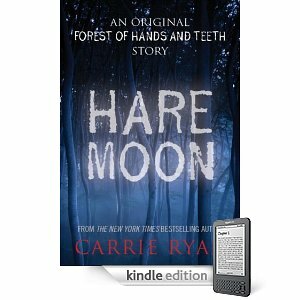 Most recently, Carrie Ryan's short story "Hare Moon" , which has appeared in a previous anthology, was made available for download about two weeks ago. It's set in the same world as her Forest of Hands and Teeth series, some years before the first book. When I went to Carrie's signing last March, she talked about and I was interested in reading it, but I never got around to grabbing that anthology it was in. I was able to download it and read it in about an hour, and it was lovely to return to that world again. Similarly, Melissa Marr has a few short stories available for download that go along with her faerie series. They are "Old Habits" and "Stopping Time" (and if you haven't read her series, Wicked Lovely is available for only 99 cents right now ). Julie Kagawa, author of The Iron King , also has a short story available for $2.39, "Winter's Passage" that follows along with her series. Jenna Black's "Remedial Magic" is free, and is a bonus Faeriewalker story. Likewise, Shannon Delaney's "Beasts and BFFs" is a prequel story to 13 to Life and is free. And if you are a fan of Rachel Vincent's Soul Screamers series, download the prequel story "My Soul to Lose" for only $2! There are tons of fun short stories out there that are related to some excellent books, and I hope you check them out! It's my hope that you all come to love short stories just as much as novels, because I think we're going to start seeing way more of them in future, especially with the introduction of Amazon's Kindle Singles and the popularity of inexpensive e-books among teen readers! Do you have some favorite short stories? Tell me about them in the comments! 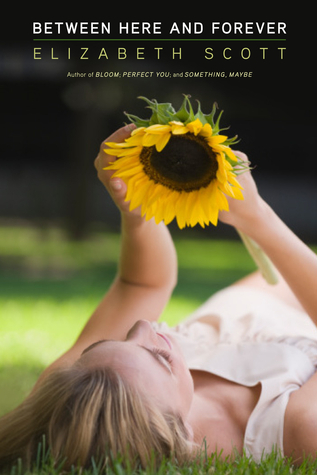 In a futuristic world where only those under eighteen can conceive, Melody has the perfect life. She's sixteen, rich, popular, and she has one of the best conception contracts with a wealthy couple. Now, all she's waiting for is for the couple to choose a guy for her to bump with. But then, her long-lost twin sister Harmony shows up on her doorstep. Harmony was raised in Goodside, a religious community that believes paid conception is wrong, and Harmony is determined to convince her sister to break her contract. Melody is less than welcoming, but things get even more complicated when the girls mistakenly switch places, forcing them to decide what they truly believe in once and for all. There are a lot of things about Bumped that make it engaging and realistic. McCafferty does an excellent job at bringing the culture of this future United States alive. Girls everywhere look forward to being pregnant by sixteen, consumers glamorize pregnancy, and maternity clothes are in. There is a wide vocabulary of slang words (that tend to be slightly crass by today’s standards) to compliment this, which makes the book slightly confusing at first, but the reader will be able to pick up on them quickly. While she does do a good job at setting the stage for the book, it would have been interesting if McCafferty could have provided more background info on virus that renders adults infertile, and the effects of it early on. However, the story moves at a good pace, bouncing back and forth between the twins' points of view. Each sister changes quite a bit throughout the course of the book as the girls are forced to examine everything they have been taught to believe in and decide to embrace or reject it. McCafferty also tackles religion in Bumped, which plays a large role in the story. Some readers might not like the way she bends it to fit the plot, but it's an interesting element and provides room for plenty of thought and conflict between the characters. It's hard to get past the idea of parents pimping out their teenagers for the sake of continuing humanity, but McCafferty has written a book that will be thought-provoking and incite many discussions and debates. Cover Comments: I like the egg on the cover. It hints at the book's content without being too explicit or blatant, and I like how the shot with the shadows are at the very front. The gray areas are very indicative of the struggles in this book. This is a great cover. 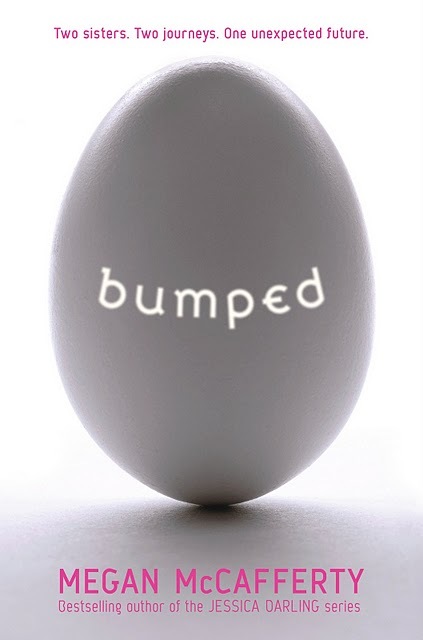 Bumped will be available on April 26th, 2011. Check out this cool trailer for the new book, Enclave , about a dystopian world where the human population is forced to live underground and isn't expected to live beyond their twenties. You can check out the author's site and read the first two chapters here!